Pictured above is my tablemate Dave McDonald at the 2008 National Sports Convention in Chicago. 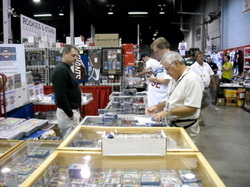 I regularly set up at Midwest card shows. My tables are filled with thousands of vintage cards. ​ TWO FREE PACKS OF CARDS FOR EVERYONE WHO ATTENDS THE SHOW! !